2011 Divot Day a Smashing Success! I’d like to thank Green and Grounds Chairman Barry Burke for organizing our 2011 Divot Day! I’d also like to thank the near forty members who showed up this morning at 7AM to participate! A tremendous turnout indeed. I’d also like to thank Jim McMahon Sr. who started this wonderful event several years ago. Without his continued efforts this event would not be possible. The members were first treated to a quick breakfast by General Manager, Sean McLaughlin. At 7:30am, six teams of at least six “divot-fillers” hit the course. By 9am every divot on every tee and fairway had been filled. I think that is a new record! I’m very proud to be a part of this outstanding team of members and staff. We all have the same common goal… Take care of our course! It's Raining Here But It's U.S. Open Week! Six inches of rain in the last week and still climbing! Today’s heavy rain, coupled with the already saturated ground conditions, will ensure that our weekend’s course conditions will be soggy to say the least. I’m pretty tired of posting that “Carts must stay on paths and follow white lines”. One positive of this weekend is the U.S. Open! One of my favorite tournaments of the year! This year the tournament is being played at Congressional Country Club in Bethesda, Maryland. I was lucky enough to watch a little of the first round yesterday. While the course was set up long, 7,514 yards, it looked pretty fair. One thing I did notice was some of the areas on and around the greens where the creeping bentgrass was definitely stressed. 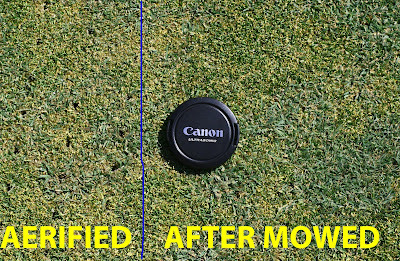 Congressional went through a complete rebuild of the greens in 2009 and used an A-1 / A-4 creeping bentgrass blend. These are two of the newer, denser cultivars of creeping bentgrass on the market and are rated very highly. Included in the rebuild was a “state-of-the-art” Sub-Air system. This is basically a system which is attached to the drainage pipe network under the green and has the capability of sucking excess moisture out of the soil profile or pumping air in when oxygen levels are depleted. The hot weather of late, in conjunction with the increased maintenance required for this type of tournament looks to have taken a bit of a toll on the turf health. No matter how good or how many tools are at the superintendent’s disposal, Mother Nature still holds the cards. I’m glad to see that no one is painting the turf green or hiding the brown spots with green camera filters. I think it’s important for the golfing public to see what happens to turf when we stress it to that extent. I’ve been enjoying the “behind the scenes” blogging by Scott Hollister and his team at GCM. GCM is the official blog of The Golf Course Superintendents Association of America's, Golf Course Management Magazine. The entries have covered everything from first round course set-up, to course conditioning, to “what’s up with the greens”? They even have Twitter updates. Great Stuff! 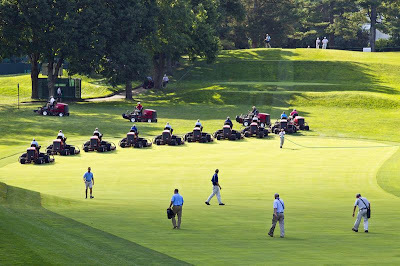 Good luck to Congressional CC’s Director of Golf/Superintendent, Mike Giuffre and his maintenance team this week! I’m looking forward to one of my favorite things about Father’s Day, final round at the U.S. Open! Greens To Get a Little Love! Next week is the perfect opportunity to perform some uninvasive maintenance practices that will help our greens survive the stress of summer. There is no outing on Monday June 13th and no events scheduled until the FWGA Super Senior event on Thursday June 16th. Both the golf schedule and the long range forecast are perfect for us to accomplish our goals of balancing turf health with member satisfaction. While playing conditions won’t be ideal on Monday June 13th and Tuesday June 14th, the results for the rest of the week and beyond will be very positive. We are going to lightly verticutt, needle-tine (vent) and topdress the greens. Verticutting helps reduce grain and needle-tining helps get necessary oxygen to the roots of the turf plant. Topdressing smoothes the surface and enhances the results from both processes. 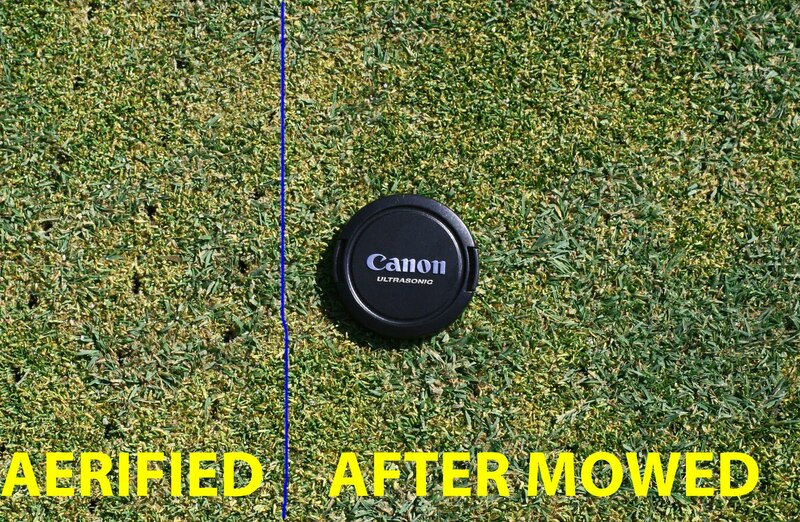 By Wednesday or Thursday our members will notice the improved putting conditions and turf health will increase! A “win-win” situation! We do our best to balance these types of health maximizing maintenance practices so we can increase and extend premium playability during the prime playing season. It is a delicate balancing act indeed. I encourage you to continually provide me with feedback on our results. The maintenance plan is a program based on many ever-changing factors designed to maximize your positive experience. We take advantage of every “off-peak” opportunity to continually give you premium “in-peak” results. Don’t misunderstand what I’m saying… Monday and Tuesday will not be so bad! Yes we will be busy and in your way from time to time, but the positive results will be long lived and well worth the minor inconvenience.